When I got to visit the Old City Hall, the place was just stuffed with Chairs. The Historical Society will be selling them off next month. 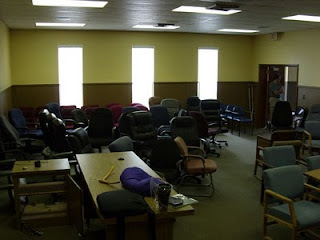 These were the office chairs that were declared surplus and will help fund the Society for their work. Usually when you would go into the Chambers for a Commission Meeting, the place would be lined up with rows of Black Plastic Chairs for everyone to sit down and see the meeting. They weren't very comfortable, and it might have been better to use some of the old office chairs. On the other hand, instead of having these things being set out in a landfill they're going to be sold and do some good work. On the other hand, the table in the foreground is the conference table around which the City workers would sit in order to be available for any questions in a Commission Meeting. 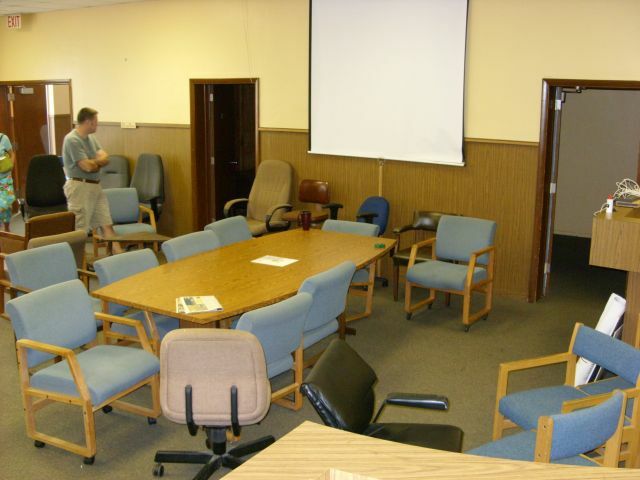 These blue chairs were lined up around it and occupied by the various department heads. It will be sold if it hasn't been already. If you need a chair, a lot of them have already been sold off, as well as some of the equipment that was left in the building. I should know, I've got one of the chairs from the Dais that I used to use when I was on there for my board. Comfortable chair too, I started to drift off when I was sitting in it working on my netowrk here at home at my desk. You missed that one, but the sale is coming up!